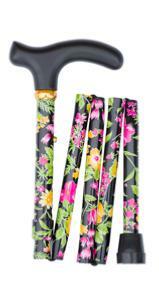 A compact and convenient cane that folds to five sections instead of the usual four, making it easy to stow in a handbag or similar. Made from high quality aluminium, fitted with a wooden handle and a non-slip rubber ferrule. The pattern features tropical flowers in hot pink and golden-yellow with green foliage on a black background. The cane is easily height-adjustable between 84 and 92cm (approximately 33"-36"), making it suitable for a wide range of users. The mechanism is fitted with a screw-tightening nut so that, once adjusted, the cane is fully secure and will not rattle.